But the research, published this week in the journal Circulation, is not so much a celebration of red meat as it is an indictment of processed meats like bacon, sausage and deli meats. Eating one serving of those foods a day was associated with a 42 percent higher risk of heart disease and 19 percent increased risk of diabetes. 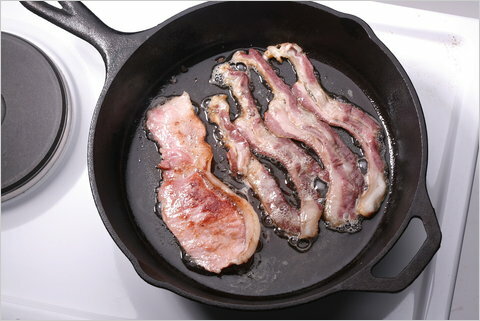 But there was no increase in risk associated with eating unprocessed red meat. The findings come from a broad analysis of several studies tracking meat consumption and cardiovascular diseases and diabetes. Processed meats include bacon, salami, sausages, hot dogs or processed deli or luncheon meats. Notably, the culprit in processed meats wasn’t the saturated fat or cholesterol — both whole cuts of meat and processed meats contained the same amount per serving. The big differences were the levels of sodium and chemical preservatives. Processed meats had about four times more sodium and 50 percent more nitrate preservatives than unprocessed meats. The study suggests meats like burgers and steaks have been wrongly implicated in heart disease. But that mistake likely occurred because the people who eat a lot of meat also tend to consume high amounts of bacon, hot dogs and other processed meats. While it’s true that the study will make it easier to enjoy a burger, at least if we’re worried about our heart, it doesn’t address research that has linked an increased risk of colon cancer with high meat consumption. In addition, many people skip red meat not for personal health reasons but because they are concerned about the health of the planet.